Excessive thirst is an abnormal feeling of always needing to drink fluids. Drinking lots of water is healthy in most cases. The urge to drink too much may be the result of a physical or emotional disease. Excessive thirst may be a symptom of high blood sugar (hyperglycemia), which may help in detecting diabetes. Excessive thirst is a common symptom. It is often the reaction to fluid loss during exercise or to eating salty foods. Because thirst is the body's signal to replace water loss, it is most often appropriate to drink plenty of liquids. For thirst caused by diabetes, follow the prescribed treatment to properly control your blood sugar level. Excessive thirst is ongoing and unexplained. Thirst is accompanied by other unexplained symptoms, such as blurry vision or fatigue. You are passing more than 5 quarts (4.73 liters) of urine per day. The provider will get your medical history and perform a physical exam. How long have you been aware of having increased thirst? Did it develop suddenly or slowly? Does your thirst stay the same all day? Did you change your diet? Are you eating more salty or spicy foods? Have you noticed an increased appetite? Have you lost weight or gained weight without trying? Has your activity level increased? What other symptoms are happening at the same time? Have you recently suffered a burn or other injury? Are you urinating more or less frequently than usual? Are you producing more or less urine than usual? Have you noticed any bleeding? Are you sweating more than usual? Is there any swelling in your body? Do you have a fever? Your provider will recommend treatment if needed based on your exam and tests. For example, if tests show you have diabetes, you will need to get treated. A very strong, constant urge to drink may be the sign of a psychological problem. You may need a psychological evaluation if the provider suspects this is a cause. Your fluid intake and output will be closely watched. 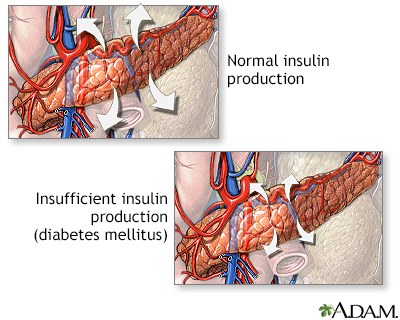 Mortada R. Diabetes insipidus. In: Kellerman RD, Rakel DP, eds. Conn's Current Therapy 2019. Philadelphia, PA: Elsevier; 2019:277-280. Slotki I, Skorecki K. Disorders of sodium and water homeostasis. In: Goldman L, Schafer AI, eds. Goldman-Cecil Medicine. 25th ed. Philadelphia, PA: Elsevier Saunders; 2016:chap 116. Reviewed By: David C. Dugdale, III, MD, Professor of Medicine, Division of General Medicine, Department of Medicine, University of Washington School of Medicine. Also reviewed by David Zieve, MD, MHA, Medical Director, Brenda Conaway, Editorial Director, and the A.D.A.M. Editorial team.